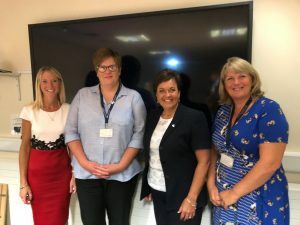 This morning I joined the Cwm Taf UHB Therapists team for a roundtable and detailed conversation about the role of occupational therapy in local health and care services, and how they are supporting vital changes in delivering our local services. There are some 159 therapists employed across Cwm Taf (142 FTE) with additional therapy posts directly employed by the local authorities. Like many other services they are shifting the focus of resources from hospitals in to the community as they can make a huge difference in helping people to lead more active lives and in keeping people out of hospital. So their contribution to multi-disciplinary and award winning schemes like ‘Stay Well at Home’ (see here) provide valuable lessons that all parts of the NHS and care service can learn from. ‘Stay Well at Home’ provides a 7 day service which is multi-disciplinary and integrated. In this scheme the therapist can commission a care package within four hours. They are also part of the skills mix that supports the virtual ward – the evidence and success of which is of growing interest. Therapists can be one point of expertise that deals directly with a patient problem and helps to reduce pressure on GPs. The Therapists in Cwm Taf are also delivering great results through their work on Early Supported Discharge which is reducing the average length of stay for those patients in hospital. This is good news as patients can spend less time in hospital and return to their home setting. Therapists work in mental health, within integrated autism services, in dementia services and critically on re-ablement which means a patient can agree a plan, after treatment, which encourages independent living. So more of this please as we shift the focus on our services to support and prevention. Let us continue to train more therapists and open up more avenues in to therapy work. I was also struck during the conversation by the need to measure the right things, and how ‘targets’ can sometimes be blunt instruments that do not properly measure the success of innovation and change. I will look at this issue in more detail as I continue to look at local health and care services. Incidentally it also strikes me that OTs is a career path with so many flexible opportunities and move through a full career if that is the wish. The evidence of the wellbeing it supports seems clear across a range of settings. I also want to think about how we open up low level entry points as has been achieved with health care support workers. Wellbeing is also reinforced by their current work and emerging best practice around a positive approach to care. Thanks to Dai Davies at Royal College of Occupational Therapists for joining our conversation and you can read more about OTs here.